(Nanowerk News) The use of plasmonic black metals could someday provide a pathway to more efficient photovoltaics (PV) -- the use of solar panels containing photovoltaic solar cells -- to improve solar energy harvesting, according to researchers at Lawrence Livermore National Laboratory (LLNL). The LLNL Materials Engineering Division (MED) research team has made breakthroughs experimenting with black metals. These nanostructured metals are designed to have low reflectivity and high absorption of visible and infrared light. The MED research team recently published their black metals research results in a cover-page article in the May issue of Applied Physics Letters titled "Plasmonic black metals in resonant nanocavities". Authored by MED physicist and research team member Mihail Bora, the article details the work of the nanophotonics and plasmonics research team led by LLNL engineer Tiziana Bond. 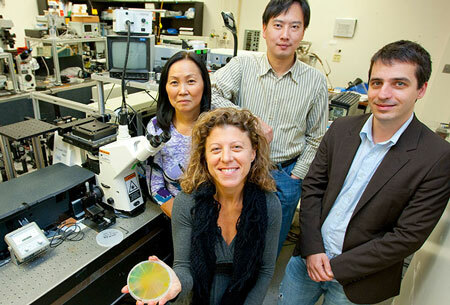 LLNL engineer Tiziana Bond (center) is holding an etched silicon wafer with the nanopatterns. Second row from left to right: Bond's nanophotonics and plasmonics research team members from the LLNL Engineering Directorate Elaine Behymer, Allan Chang and Mihail Bora.